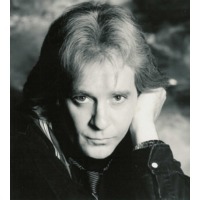 Eddie Money (born Edward Joseph Mahoney, March 21, 1949 in New York City, New York) is an American rock guitarist, saxophonist and singer-songwriter who found success in the 1970s and 1980s with a string of Top 40 hits and platinum albums. Rock impresario Bill Graham said of Money "Eddie Money has it all...Not only can he sing, write and play, but he is a natural performer." Money originally followed his father's footsteps and became a police officer in the late 1960s. As his interest in music intensified, he eventually ended his law enforcement career in favor of becoming a full time musician. He moved to Berkeley, California and became a regular at area clubs, where he eventually got enough attention to secure a recording contract with Columbia Records. Later in the 1970s, he charted with singles such as "Baby Hold On" and "Two Tickets to Paradise". Money continued his successes and took advantage of the MTV music video scene in the early 1980s with his humorous narrative videos for "Shakin'" and "Think I'm in Love", but his career began to fail him after several unsuccessful releases in the mid-1980s, accompanied by his struggles with drug addiction. Money made a comeback two years later in 1986 and returned to the mainstream rock spotlight with the album Can't Hold Back, which featured a Ronnie Spector duet with "Take Me Home Tonight", which reached the Top 10, along with the hit "I Wanna Go Back". Money followed the album with another Top 10 hit, late 1988's "Walk on Water", but his Top 40 career ended following the #21 placement of "I'll Get By" in 1992. During the 1990s and 2000s, Money continued to release numerous compilation albums along with several albums featuring new material. Today, he still tours the "Oldies" circuit regularly, often accompanied by other successful rock acts from his era, and has also made several television appearances on American sitcoms. Since 1992, Money has traditionally opened the summer concert season for DTE Energy Music Theatre in Clarkston, Michigan.